At the 2014 State of the Valley conference, Salman Khan, founder of Khan Academy, joined a distinguished list of Silicon Valley icons Joint Venture has recognized because they embody the spirit of the man for whom Joint Venture’s highest honor is named, David Packard. Like David Packard, Khan has brought the civic entrepreneurship approach to improving our community. He has reinvented education for future generations both here in Silicon Valley and around the world. 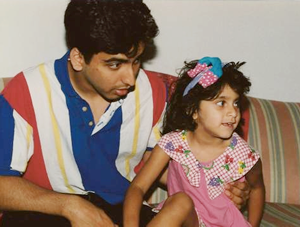 When Sal began tutoring his young cousin, Nadia, and placing his lessons online in 2004, no one could have predicted that these one-on-one lessons would evolve to become the ubiquitous Khan Academy whose mission is to provide a Free World-Class Education for Anyone, Anywhere. Just how ubiquitous is it? 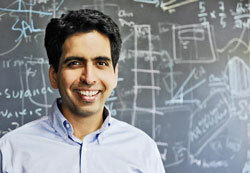 Today Khan Academy receives visits of more than 10 million students every month from all over the globe. In the last two years alone, students have viewed more than 350 million lessons. Khan Academy offers more than 5000 instructional videos covering math, biology, physics, chemistry, statistics, probability, programming, economics, history, art history, medicine, nursing, and topical issues. Khan Academy students have completed more than a billion and a half exercise problems are doing so at more than 4 million exercises per day. Like David Packard, Khan has brought the civic entrepreneurship approach to improving our community. He has reinvented education for future generations both here in Silicon Valley and around the world. Today more than 200,000 educators around the world are using Khan Academy to help students build mastery of topics and free up classroom time for more discussion and dynamic project based learning. Truly, Sal has changed education forever. Sal learned early on that his method of delivering content allowed each of Khan Academy’s students their dignity. If a student doesn’t understand a given lesson, the student can replay the lesson time and time again, solve problem upon problem, and not suffer the social embarrassment of not understanding as quickly as their classmates. Khan Academy’s self-paced approach to learning has allowed students who were placed in a remedial track to overcome their learning gaps and go on to be top students in a higher-level track. Each exercise has hints and ultimately offers the solution. Once a student learns how to go about the solution, Khan Academy serves up a similar problem to test whether the student has mastery of the concept. Students living in countries that deny certain segments of their population access to education can do so in the privacy of their home or underground school, given they have access to the internet. Schools that do not have such access can still benefit from teachers that do. The teachers learn using Khan Academy and then teach their students what they have learned. Sal has broken the code to democratize education. To more fully understand Sal’s commitment to his work and why TIME magazine named him one of the “100 most influential people in the world,” we need to start at the beginning. Sal was born in New Orleans in 1976, the son of Jamal Khan, a pediatrician from Bangladesh, and his wife, Mahooda, who was from India. Sal’s first memory of schoolwork was watching his uncle doing calculus problems. “What’s calculus?” he asked. The uncle responded that it was necessary in order to become an engineer and told Sal he, too, should be an engineer and go to M.I.T. But growing up, Sal was more interested in art than math and he wanted to be a cartoonist, or an architect. At Grace King High School in Metairie, Louisiana, he also played guitar and sang – or as he describes it, “growled” – in a heavy metal band. Gradually, though, Sal grew enamored by theoretical physics, of all things. So he persevered in math and science, and was accepted to M.I.T. There he regularly took seven or eight classes every semester with thoughts of medical school or law school, and was excited by his first exposure to computers and software. With such an accelerated program, Sal graduated from M.I.T. in 1998 with three degrees: a bachelor of science in mathematics, a combined B.S. in electrical engineering and computer science, and a concurrent master’s degree in electrical engineering. Oh, and as his class president, he received his diploma from another president – Bill Clinton. After two years in California working for Oracle, Sal headed back to Cambridge and the Harvard School of Business, where he not only earned his MBA but also reconnected with a Pakistani woman he knew from M.I.T. Her name was Umaima Marvi, and she was completing her medical education at Harvard. 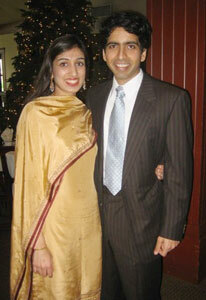 Sal and Umaima eventually married in 2004 and now have two children: Imran, who is 4, and 2-year-old Diya. After Harvard, Sal became an analyst with a hedge fund in Boston, but he never lost his fascination with education and how people gained a fundamental understanding of problem solving and other knowledge. In 2004, as a side project, Sal began tutoring his young cousin in math by telephone with an interactive notepad. Within two years, he added more than a dozen relatives and family friends to his online classes. By then he was writing software for his students to practice, and created lessons on YouTube. By 2009, Sal quit his day job to run the new non-profit Khan Academy full time, with financial support not only from us, but also from the Bill and Melinda Gates Foundation and other contributors. Even as he now runs a growing company with more than 50 employees, Sal is very hands-on, visiting classrooms and creating video lessons. Sal’s impact on education, here in Silicon Valley and around the world, has been immeasurable. And it can only grow exponentially from here. Sal foresees a day not too far from now when Khan Academy will have 25 to 50 million users every month. As the 2014 Silicon Valley Index shows, 46 percent of our region’s population have bachelor’s degrees or higher. But not every region, in our own country and certainly around the globe, provides the opportunities for learning that we have. As for Sal’s little cousin, Nadia, she is currently a senior at Sarah Lawrence College and expects to graduate this year.